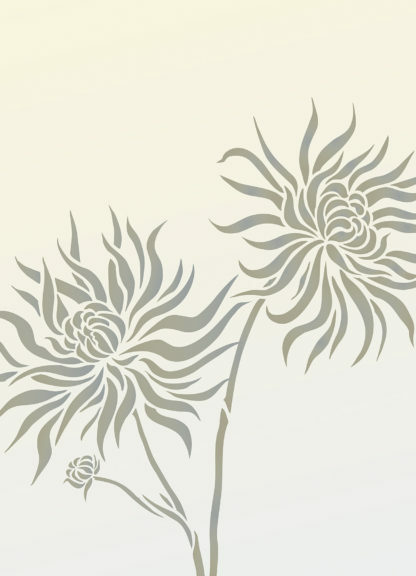 2 Large scale flower wall stencils. 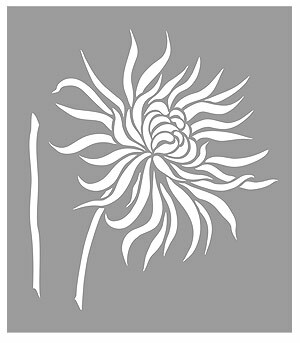 Chrysanthemum Flower Stencils 1 and 2 – two extra large single Chrysanthemum flower stencils for impressive wall art creations and fabric decoration. Original design by Henny Donovan. 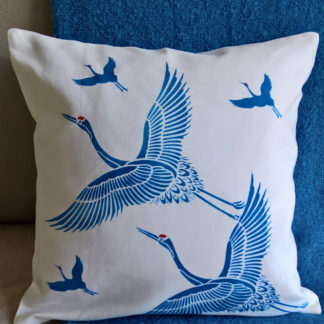 Use this up-scaled design to create stunning wall features in bedrooms, hallways and living spaces; or print fabrics to create unique bed linen, full length curtains or simply as hanging art. 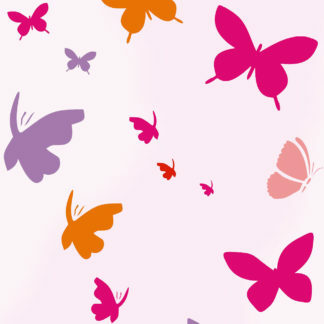 Stencil on white or coloured backgrounds, in graphic colour schemes or muted subtle tones, as well as reflective metallics. See Size Specifications Below. 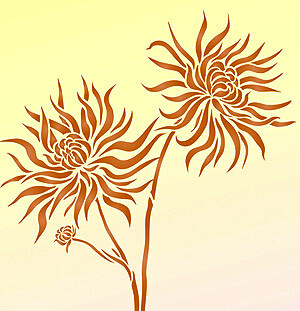 Above – Chrysanthemum Flower Stencils 1 and 2 in Seville Orange and Sienna Stencil Paints. 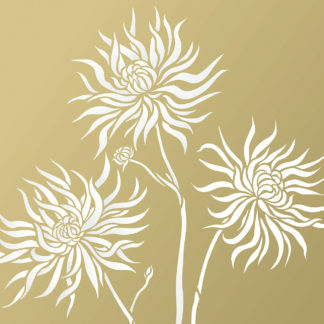 Buy individually as Chrysanthemum Flower Stencil 1 or Chrysanthemum Flower Stencil 2. 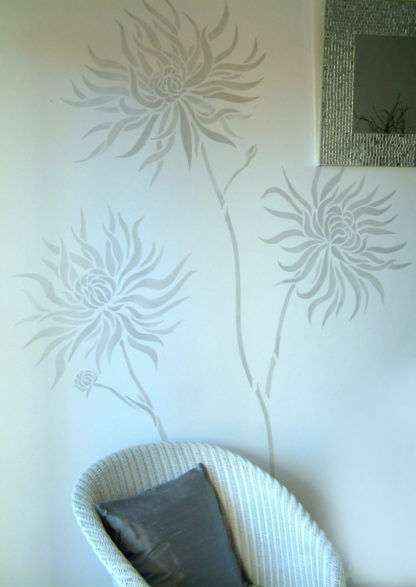 Stencil this oversize design with our Stencil Paint range and Stencil Rollers and Stencil Sponges. 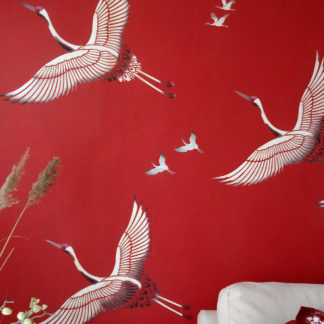 Or use coloured spray paints – to cover large areas with subtle veils of colour. 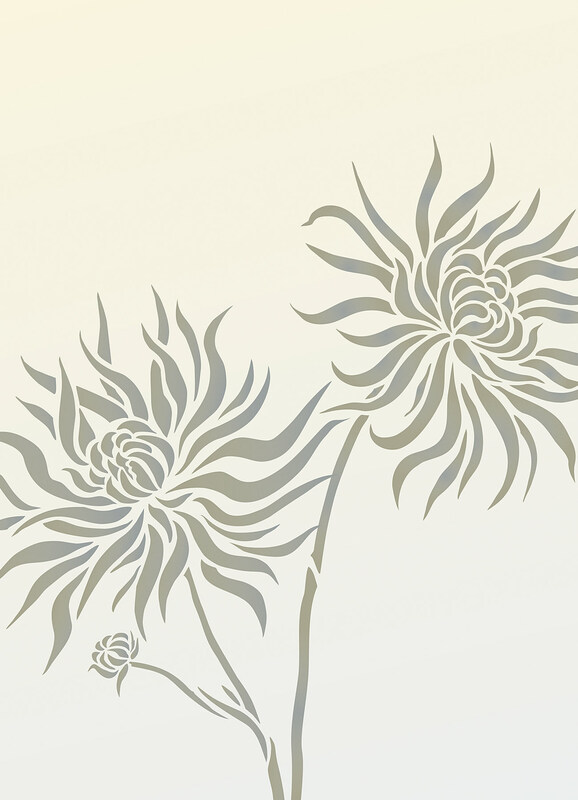 Above – Create graceful, contemporary impact with Chrysanthemum Flower Stencils 1 and 2 stencilled in Shoreline and Ice White Stencil Paint, over-stencilled with Pearl Metallic Stencil Paint, on a pale grey background. 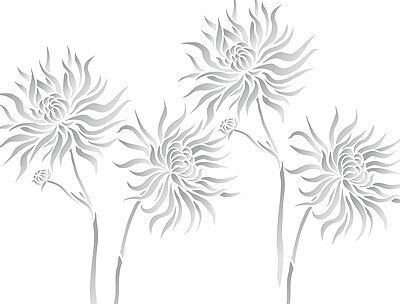 Above – space Chrysanthemum Flower Stencils 1 and 2 apart or clustered together for different organic designs. 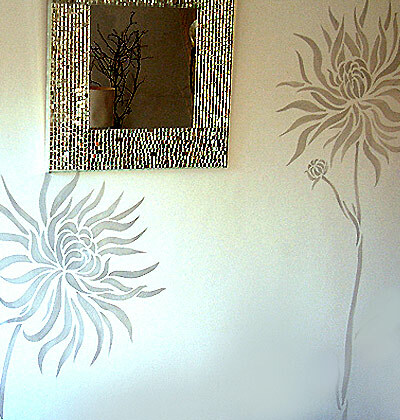 Using Metallic Stencil Paints adds extra nuance and reflectivity to your creations. 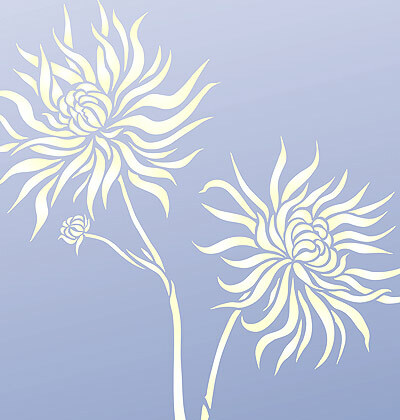 Above – Chrysanthemum Flower Stencils 1 and 2 in subtle Ice White, blushed with a little Evening Primrose Stencil paint on a grey-blue background. 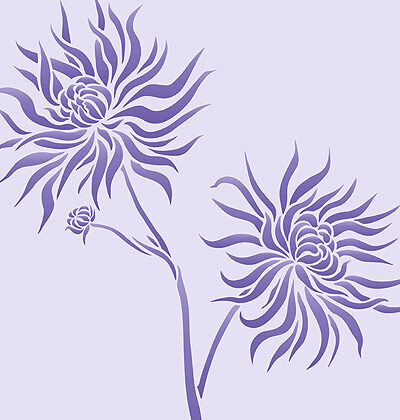 Above – Chrysanthemum Flower Stencils 1 and 2 in Forget-me-not and French Lavender Stencil Paints on a dusky lilac background. 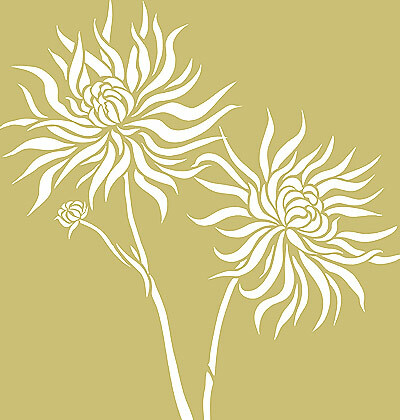 Above – Chrysanthemum Flower Stencils 1 and 2 in simple silhouette Ice White Stencil Paint on a rich yellow ochre background. 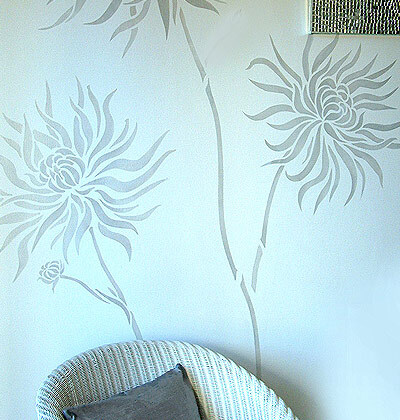 Above – Chrysanthemum Flower Stencils 1 and 2 repeated in a clustered grouping in soft tone of Shoreline Stencil Paint. 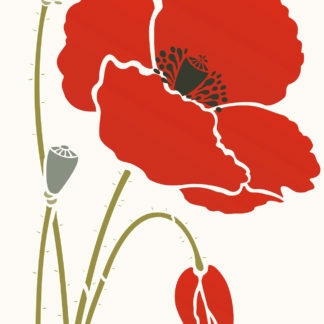 Two large one layer stencils on two large sheets with additional stem section on main sheet, so flower stalk can be extended as desired. Flower head approximate width 54cm (21 1/4″) and depth 57cm (22 1/2″). The flower head with stalk is 66cm (26″) tall. 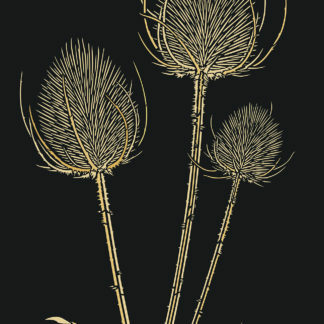 Additional stalk motif is 43cm (17″) – for extending flower stalk, so height of flower stem can be added to as required. Sheet size 66cm (26″) wide by 80cm (31 1/2″) deep. Layout below. 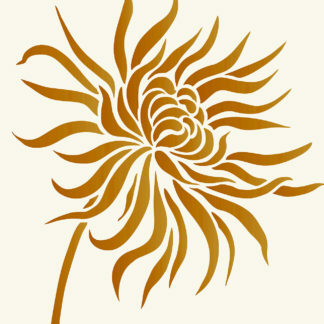 Flower head approximate diameter of 56cm (22″) across the width of the design. 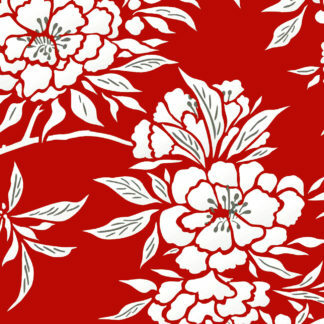 Additional stalk motif on the sheet is 50cm (19 3/4″) long. Sheet size 66cm (26″) wide by 90cm (35 1/2″) deep. Layout below. 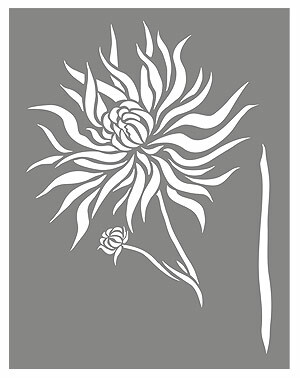 Chrysanthemum Flower Stencils 1 and 2 actual stencil layout.